Any natural disaster that destroys lives and livelihoods is horrific, but the recent earthquake and tsunami off the coast of Japan hit me really close to home. I was born in Tokyo, and my relatives are all there, living in and around Tokyo. I also have close friends there as well. When the disaster struck, it took us a couple of long worrisome days before we were able to ascertain the whereabouts of our loved ones. Like many people, I felt like hopping on the next plane to Japan – to hand out supplies, to be a shoulder to cry on, to do anything I can to help. But reality is that the best way to help is by donating to support the folks who are already on the ground doing these things, professionally. So we donated what we could. But still, I was left with that feeling of wanting to do more. I felt guilty eating three hot meals a day and sleeping under my down comforter when the people in the shelters were so thankful for the small ration of rice balls and using curtains as make-shift blankets. This photo made me cry. 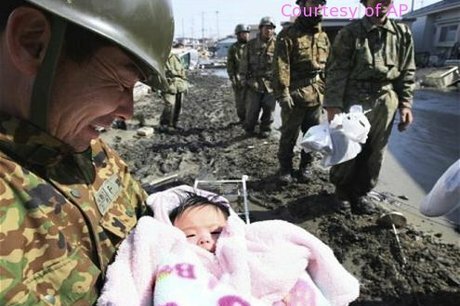 A baby girl miraculously rescued from the rubble three days after the tsunami. That is why starting 5pm PDT on April 19, and through midnight PDT on May 8, Marcopoloni will donate 5% of net proceeds from our online sales to the Japan Earthquake and Tsunami Relief Fund through GlobalGiving.org. We are limited in what we can do, but as the Japanese people say, “even dust can amass to become a mountain.” Thank you for helping us help a people in need, and for keeping them in your thoughts and prayers. Next PostNext How Can We Use Less Plastic?